Wellbeinginwork.com is the specialist Corporate branch of All About U, offering unique Health & Wellbeing benefits for companies and organisations in London and the South East using combinations of treatments with a network of therapists. All of our therapists are highly experienced, registered and insured with all of the professional national and international regulatory bodies in their individual fields of expertise. This allows them to treat successfully in all working environments onsite at your workplace. Providing safe, gentle & effective treatment. The motivation and morale of an individual or a team is significantly affected by many factors including absenteeism of fellow colleagues. Improve staff morale by offering wellbeing treatments to avoid absence and maintain optimal health and wellbeing of the staff at work. Ultimately a healthy workforce is a happy and productive workforce. Malingering Mondays or exaggerated illness is commonplace at work. Providing treatment at work is not only a perk to show the company cares but is a great deterrent for bogus absence or protracted time off chasing treatment appointments at home. We all know you have to physically be at work to be working and productive. Our aim is to maintain staffs attendance and efficiency in the workplace. It is also important to recognise that it is often injury or circumstances outside of work that contributes to absence eg. Sports, trips, falls etc. We endeavour to get staff back to work swiftly. Productivity and efficiency at work directly correlates to the ability to concentrate well being less distracted and more focussed. Our Mental and Physical balance and wellbeing at home and at work massively contributes to our efficiency and productivity. Working days lost per year. 1.2 Million workers in the UK suffer from musculoskeletal disorders annually. This is a natural virtually pain free use of acupuncture needles creating amazing results in treating pain and stress. Patients often report a sense of calm, increased concentration and wellbeing. A Postural Workplace Assessment carried out by our biomechanical expert will look not just how the workplace may contribute to aches pains and injury already suffered, but is great as a preventative measure, eliminating discomfort, increase productivity, prevent potential litigation and improve overall performance. 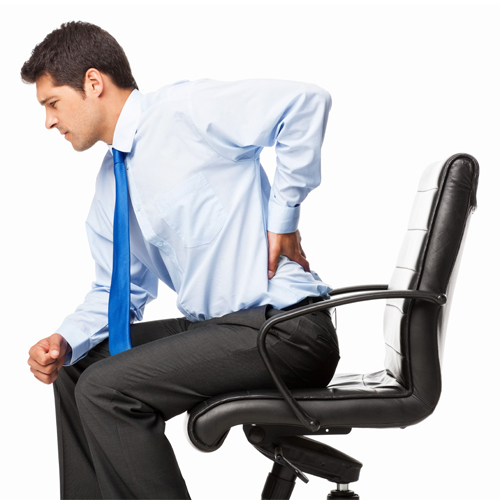 4.9 million working days are lost due to back pain every year, the cost to your business is huge. The good news is that back pain is easily treatable. © 2015 Wellbeing In Work. All Rights Reserved.